These tempeh burgers are tasty and a very good source of protein for dinner. They have all the health benefits with B12. You can make them into burgers with buns or what I do is have them with a salad or steamed vegetables. Tempeh for this recipe is very tasty when marinated. Learn How to Marinate Tempeh with This Recipe. Marinade the tempeh as per the recipe. 2. Crumble the marinated tempeh into a bowl. 3. Now mix in the flax meal, water, and herbs in with the tempeh. 5. Sauté the onions in a pan in coconut oil for 3 minutes. 6. Then add the mushrooms and sauté them for 3 more minutes. 7. Mix the onions and mushrooms in with the tempeh. 8. Now take the mixture and form into patties using your hands. Will make approximately twelve pattie. 9. Press each patty on both sides with few sesame seeds. 10. The patties can be cooked in the oven or in a frying pan. If you are baking them in the oven, preheat the oven to 400 degrees F.
11. Oil the frying pan or if you are baking them oil the baking pan. 12. If baking in the oven, bake for 10 minutes, then flip the patties and bake the other side another 10 minutes. 13. If you are cooking them in a frying pan, then cook them for 5-7 minutes on each side. Learn about onions, coconut oil, mushrooms basil, black pepper, flax meal, nutritional yeast, water, and sesame seeds. Tempeh Sauteed with Spices and Garlic For a Special Vegan Dinner -This tempeh sautéed with spices is a super easy dish to add to any vegan dinner. 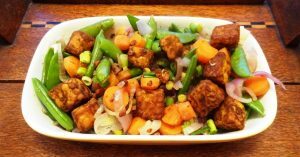 Tempeh is firmer and tastier than tofu with its nutty taste and texture and it is much healthier too making your meal full of easy to digest protein and vitamin B12.All the ingredients in this meal are very healthy. 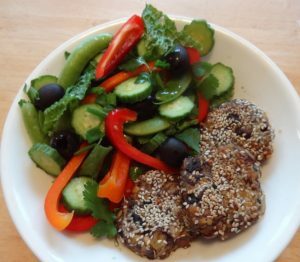 Tofu Kebabs are Delicious for Dinner and Are Vegan – Tofu kebabs are a great addition to any meal and so yummy. They are filled with nutritious vegetables and protein-rich tofu. A great vegetarian addition to a barbecue this summer too especially for those wanting a vegan option. Brazil Nut Burgers – These tasty Brazil Nut Burgers are filled with healthy ingredients and are gluten free and vegan too. This burger dish is great for a delicious and healthy lunch or dinner.